Back when I was growing up, the two things that kids could get into that scared parents senseless was Dungeons and Dragons and heavy metal. Parents were paranoid that listening to Dio or living in a fantasy world with elves and gnomes would cause their children to filp out and go on a kill-crazy rampage. Seriously. Tom Hanks even starred in a movie called Mazes and Monsters about a guy going insane playing D&D (it was awful), and Congress, because they had nothing better to do, held hearings about the dangers of heavy metal music. As seriously stupid as it is to believe that things like that could drive you to insanity, I have to admit it crosses my mind sometimes that sports might drive people out of their gourds. Think about it. You have thousands of people, who have nothing personal at stake—no money, no loved ones' lives, no jobs, nothing taken from them—but who paint their faces and get into costumes, and turn their bodies into living displays of their favorite teams. Aristotle said: "No excellent soul is exempt from a mixture of madness." And heck I'm no different—I live and die with my teams. I passed out for 16 hours when the Knicks lost to the Rockets in 1994 because my body couldn't handle their losing. I was so dejected when the Yanks lost to the D-Backs in 2001 I became physically became ill for a time. 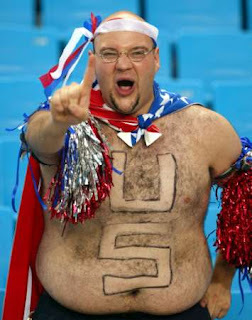 However, I draw the line at painting my stomach and sitting in freezing cold weather without a shirt. In fact, I don't own a jersey or cap or anything with a team logo on it. 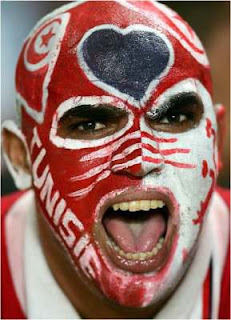 And I've never had the urge to shave my head or carve my team's logo into my teeth. I don't know why—I just never had the urge. And frankly, the people who do freak me out a bit. Again, I write a sports blog and dedicate huge blocks of time to watch games that, when it comes down to it, affect my life in no way at all—so you know I've got serious credentials as a sports nutter. 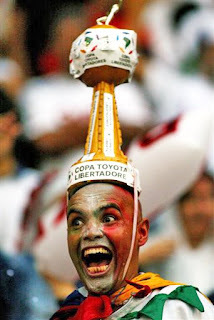 But, how does that love for a sports team turn into...well...displays of a proud kind of insanity. I mean, look at the guy with the hairdo. Really...that took a lot of work. 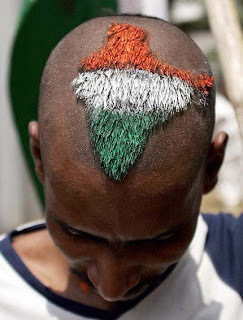 He got someone to agree to shave his hair into the shape of India, then dye it the correct colors of the cricket team. Man, th at's a lot of work. Never mind coming up with the idea in the first place; that's tough to execute. 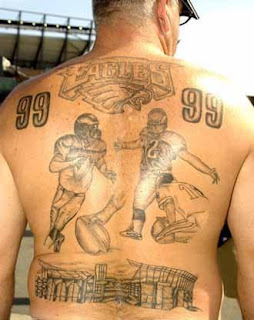 Or look at the guy with the back tattoo. I'm all for supporting your team...but mutating your body in an painful manner by putting a bizarre montage of your favorite game...a wedding ring by comparison, which you would assume would matter more, is about an inch big. And can be taken off. So help me out here. What am I missing? Why the urge to shave your back hair into your favorite Nascar number? Why does dressing up like a biker-Skeletor make you feel like you're supporting your team better than me? And what's with the face paint? And I'm not putting down those guys (and gals) who do that. (OK, maybe a little.) I'm just curious. I lied. In point of fact, I do have something that has a logo on it. A Yankee key chain. But it's a bottle opener too. You know. For my beers. So I showed my fan-dom. And it didn't involve costumes, needles, shaving or looking like this guy. I don't think I could explain it eventhough I did it. I painted my face in high school for the football, BUT I got extra credit for doing it.